You’re in a onesie, you aren’t being ironic and you haven’t washed since at least the day before yesterday. Get out of the library. You are a risk to humankind and yourself! You’re probably in a onesie because you arrived at the library at about 10 or 11 the night before. Yes, those brave souls embarking on all-nighters need comfort, but this is no excuse, just stick some trackies on with a comfy hoody. Do not stoop as low as the onesie. Onesies should be worn for fancy dress as a joke, or kept on the confines of the sofa, behind closed doors. Worse still, you’ve brought your slippers with you and you’re getting far too cushty. The library is not a holiday destination. This is not a mini-break. If you are keeping a wash-bag with you, packed with shaving gel, razors, face wipes, the lot. Then just go home. As much as it may seem like you do, you do not live in the library. If you’re doing your makeup or trimming your beard (or both – it can happen, I’ve seen it) in the library, it’s gone too far. The sign that you’re doing this is that your trim probably isn’t even and you’ve got too much blusher on, because it’s been applied under those harsh library strip lights. If you’re wearing your going-out outfit, this could mean one of two things; either you’re wearing it ready to go out once you’ve finished your essay, or you went post-club because you had an incredible eureka moment and needed to type that gold dust down. If it’s the former, chances are you’ll distracted thinking of your night out and so not working to the best of your ability. If it’s the latter, then Oh dear Lord, someone needs to find you, wrap you up in one of those silver warmth blankets and get you home. These are desperate times. You’ve started to acquire a smell best described as less than pleasant, your hair is a greasy mess and your clothes are more sweat patch than fabric. Word has got round that you’ve been there too long and people are avoiding sitting next to you. A sure sign of this is the library getting increasingly crowded while the seats around you remain empty, until some unlucky individuals see the free seat next to you, do a lap around the room to confirm that this is the only free spot, before sighing exasperatedly and sitting down next to you. This is a short but not so sweet sign that you’ve moved into the library and it might be time to leave. Sort it out! At some point during your time at university. You’re guaranteed to be in the library at gone midnight, to be greeted by someone sound asleep at their desk. 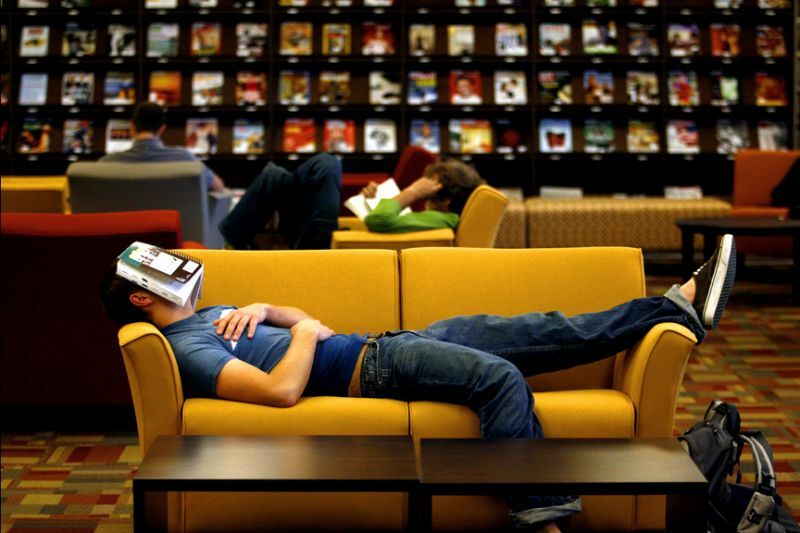 The Library at night can be a depressing, tiring place and as the sky darkens and the library empties, you may be tempted to join them for a quick kip. Don’t! You’ll wake up two hours later, feeling worse than before you fell asleep, worrying that someone might have seen you. You went with the best intentions, you had all your equipment; rulers, compass, protractor, large can of ‘Monster’ and your copious notes. You got up all the important tabs for your research, then got up YouTube and have started watching ‘things related to your course’. Look at the bottom right corner of your screen. If the time reads any later than 01:00 and your internet history is nothing but videos of dancing penguins and people falling over, then you’re just wasting a valuable library computer. When you go to the toilet to splash your face and have a little cry, if you return to find a perfectly sculpted arse grove on the chair; that should serve as a reminder that you’re wasting your life. It’s definitely home time. Most University libraries will send the cleaners round in one big sweep at 6/7 am. If you find yourself still slouched in front of your computer, desperately hoping that the words you’ve been typing for the past hour have managed to form themselves into coherent sentences, then the cleaners will be forced to clean around you. From experience, there are few things that make you feel like an inadequate human being, as seeing the cleaner’s hoover circle you. People are preparing for the day while you’ve been sat in the same seat for 11 straight hours. At this point it’s more of an exercise in self-punishment than an attempt to get work done. GO HOME!